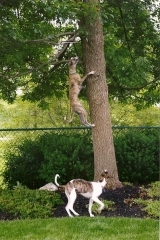 Yes, if you look in the tree, you will see Logan, in his relentless pursuit of a squirrel! Never underestimate the determination, or skills, of a Whippet. Logan is being encouraged on by his friend Lucy. 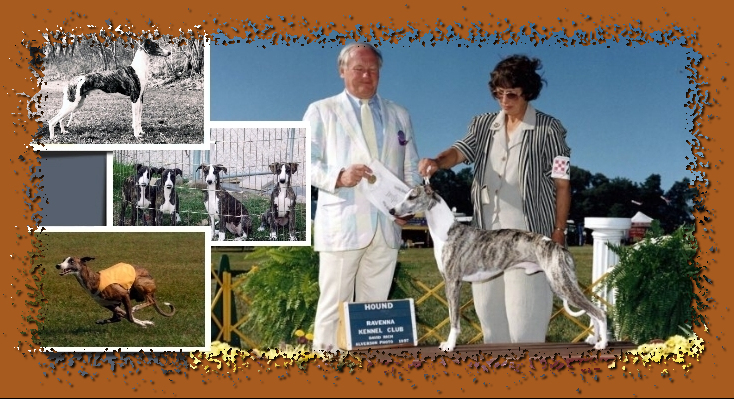 Photo courtesy of Dave and Julie Zeih, long time owners of Plumcreek Whippets! 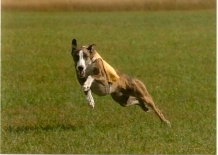 CH Plumcreek Going Big Time JC "Romeo" shows the intensity of lure coursing. 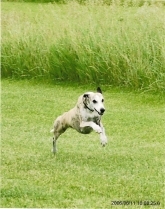 Sighthounds love to run! CH Plumcreek Come Fly With Me JC ROM "Christopher" shows them how it's done in a practice run. Winter fun! 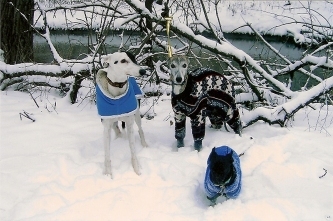 Whippets love to be bundled up in the cold weather. They can have quite the coat collection! Poor Lucy... I'm sure she thinks that if she stands there long enough, Dad will move! It's terrible when you have to share your lounge chair with your people!